From the Greek mythological hippocampus, this seahorse came into our studio as a pencil drawing on a cocktail napkin. 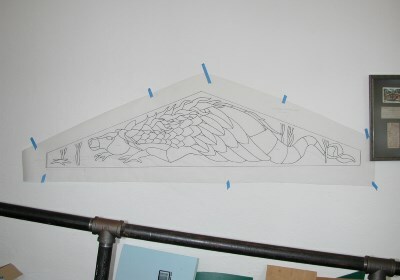 A friend of the client sketched it for her as a possible design for a large dormer window in her house. The client had three horses and it seemed fitting that a stained glass panel with a horse theme could add a different dimension to her stable of these magnificent creatures. We worked on the sketch with the client to improve the mechanical soundness of the design to avoid the potential of cracks developing because of the extreme temperature changes in Maine. At the same time, glass selection was started using the samples from the manufacturers as well as our in-house inventory. Since no one had an idea of what this mythical seahorse looked like, we had no limits on selection of glass or preconceived notions of color and texture. This turned out to be a time-consuming process. The project stirred imaginations as it took on a life of its own. Fortunately I had been using Glass Eye 2000 even before my wife and I opened a studio, so it was a natural to use it to complete the design and take advantage of the drawing capabilities and digital glass images. 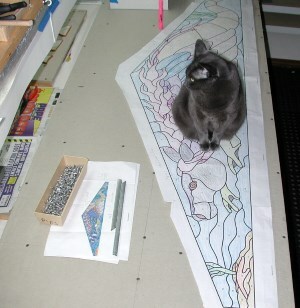 The process of getting from a pencil drawing to the printed pattern took several steps. The client and her friend worked on transferring the design from the napkin to a full-scale drawing on a long sheet of brown wrapping paper. This proved to be the easiest approach because we all were in different locations. We traced the pencil drawing on a large light table with a fine Sharpie. Minor cleanup could be done before taking a picture and importing it into Glass Eye 2000 as a background. Now I had a sharp, high-contrast image for the background. Using the tools in Glass Eye 2000,	the drawing was easily and quickly transformed into an .eye format pattern, which enabled the finish lines for the background to be completed and the glass selection to be added. It became apparent that two colors of the seahorse body would look better if they were transposed and Glass Eye 2000 makes this a mouse click. 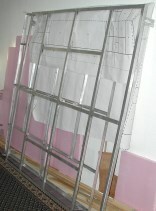 The usual two copies of the Glass Eye 2000 numbered pattern were printed, one for the large newly constructed work board and one for cutting. A final CAT scan was made and approvals done. Construction was straightforward, but working with the textured glass required careful cutting. 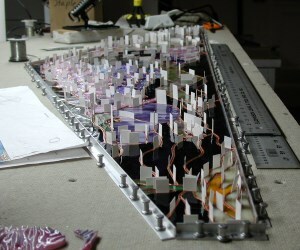 Poster board was used to evenly space the pieces before soldering. This helped get even solder widths and good solder flow between the pieces. The ability to import backgrounds into Glass Eye 2000, create the pattern on top of the imported image and color the pieces with the digital glass samples and then print it full size really helps see the completed panel. On another project, Glass Eye 2000 helped create the custom aluminum frame to hold stained glass panels in two 5' x 5' skylights. The skylight was back-lit with lights and not real windows, which eliminated any source of problems with having two big holes in the roof. 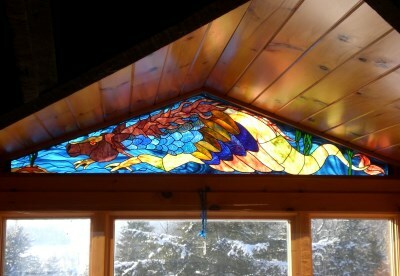 A wall switch created instant daylight behind the stained glass. I modified the line properties to reflect the width of the T sections of the frame and exported the pattern to have a blueprint house that printed the pattern in two 2½'-wide sections. The two paper prints were glued together as the layout for the welder. 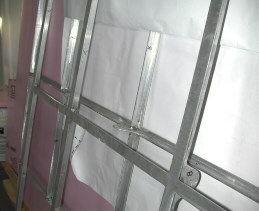 The frames were then bolted in place in the ceiling of the house. Doug and his wife Jeanne moved to an old bank in Maine when they retired in 1999. The bank building was built in 1911, but was closed for the last ten years prior to the rehab and repurposing of the brick Federal style structure. The couple built an apartment in the downstairs and created a multi-purpose studio on the main floor to play with glass. Doug took a class in 1985 during a long healing process after breaking his back in an accident. The bank was never intended to be a commercial stained glass shop but people kept coming in to ask about classes and wanting to buy glass. At some point Doug and Jeanne decided to hold an occasional class, which mushroomed into quarterly trips to Rainbow Art Glass in New Jersey for glass and tools and supplies. Birth of the only grandchild in Baltimore led to closing the shop and selling the bank home to be able to be near the new granddaughter and family. Fortunately, a couple who were students at the old bank fell in love with stained glass and bought the building to open their own shop which has become very successful. Doug now has a small private studio in his suburban home.